In this episode of the DREAM.THINK.DO. podcast, we’ll hear from behavior expert, consultant, writer, and keynote speaker, Jon Levy. How can someone start from scratch & build powerful networks of influence? How can YOU (whether you’re an introvert or an extrovert) meet new people and grow stronger, long-lasting relationships? How can YOU reach out to someone you’d love to meet, and have them be WAY more open to connecting with you? This week’s DTD guest has been interviewed by the New York Times, Fast Company Magazine and Business Insider on these subjects! Today, he’s going to share his insights with YOU! 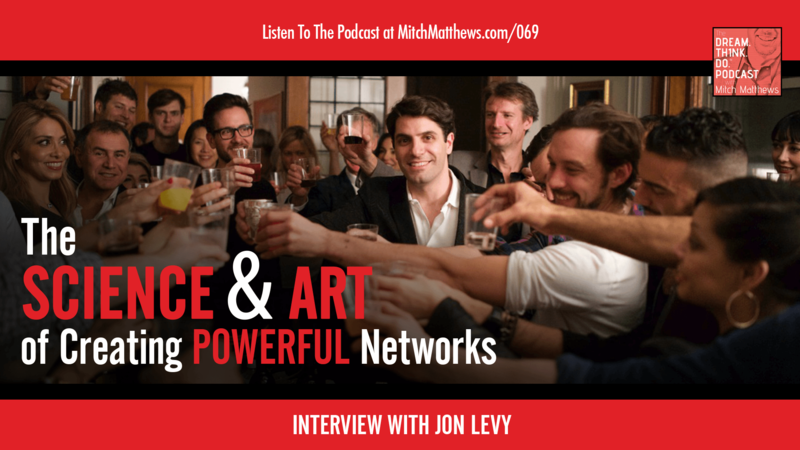 Listen in to hear how Jon came up with his “Influencers” network… a community of successful business leaders, globe-changers and celebrities. And he did it all by asking them to cook him dinner! That’s right. He asked THEM to cook HIM dinner! In this episode, you’ll hear this amazing story. Plus, you’ll also be introduced to specific strategies you can use to grow your own networks of influence… so you can dream even bigger, think better and do more of what you were put on the planet to do!